Private and personalised city experience with a hand picked Host. Whether you love luxury high end boutiques or unique vintage stores, with your Host by your side who shares your style and love of fashion, explore the very best places to shop. Stroll through trendy barrios like Malasaña or the most stylish shopping districts, browsing designers' stores, vintage markets or one-of-a kind boutiques. Discover Madrid’s distinct style, unearth hidden treasures and shop in the city’s very best stores for unique pieces so you can take a little bit of Madrid home with you. Join your Host who's been specially matched to suit your personality, needs and preferences and who shares your style and love of shopping locally. They will create a bespoke and personalised experience that’s tailored to your style and the kind of stores you’d like to visit - from delis to wine shops, clothing to homeware, your Host will know where the very best are. Discover the best of Madrid’s distinct style in the best independent stores, boutiques, markets and barrios famed for shopping. 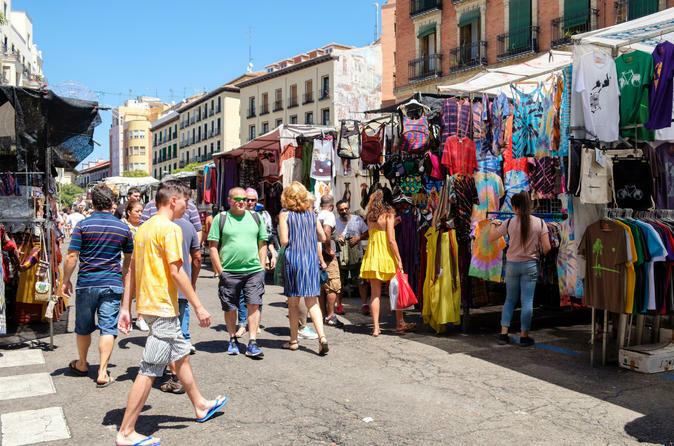 Browse exclusive high end boutiques, or take your time looking for one-off vintage pieces and locally designed clothing in Madrid’s most unique and stylish areas, and pick up some delicacies like jambon or Spanish wine to take home with you. Spend time getting to know your Host, and get some tips and recommendations for more stores and areas to shop during your trip that your host thinks you will love.